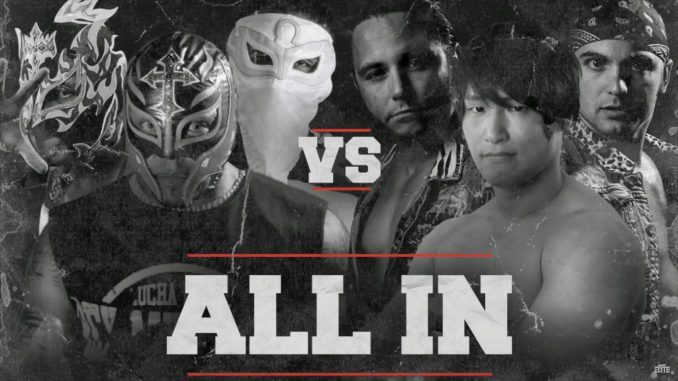 On Monday’s edition of ‘Being the Elite’, a huge six-man tag was announced for the ‘All In’ event on September 1st at the Sears Centre. The Young Bucks will team with Kota Ibushi against Rey Mysterio, Rey Fenix & Bandido in a dream match involving six of the best wrestlers in the world. Mysterio is scheduled to wrestle on the final night of the G1 Climax on Sunday, August 12th at Budokan Hall as he continues to take outside dates amidst talks of a potential return to World Wrestling Entertainment.